Meet Xiaoping Du (pronounced jhow-ping do). Xiaoping is a medical doctor and also holds a Master of Science degree. Dr. Du has worked at HEI for over ten years. He is originally from China, but previously lived and worked in Memphis, TN where he completed his post-doctoral fellowship before moving to Oklahoma City and joining our team. Part of Dr. Du’s work here includes leading a histology team (they study the microscopic structure of tissues), including sectioning and “staining” them with biomarkers to label them during research. In addition, Dr. Du also participates in numerous research surgeries. His extensive background in the anatomy of the ear and study of inner ear diseases is extremely important for the work he does at HEI. Dr. Du’s favorite food is Chinese, and his hobbies include fishing, watching television, and reading. He is married to Weihua Cheng (another HEI team member) and they have one adult son. Dr. Du says hearing loss is important to him because “hearing allows us to communicate. 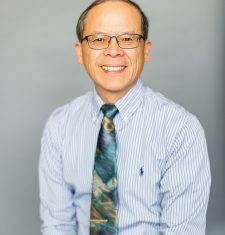 Hearing loss doesn’t just affect us physically, but also impacts our emotional and social health.” We are proud to have Dr. Xiaoping Du as a part of our team!